There was plenty of food to eat at FamilyFarmed’s March 26 Good Food Festival, which drew thousands of attendees for the annual big public celebration of the fast-growing Good Food movement. But the program at the Festival, which included expert panels, artisan workshops and chef demonstrations, also provided plenty of food for thought. The photo essay below provides a flavor of the wide-ranging events that made people wish they could be in more than one place at one time. The Festival capped FamilyFarmed’s three-day, 12th annual Good Food Festival & Conference: Photos from the Good Food Financing & Innovation Conference on March 24 can be seen by clicking here and here, and photos from the Good Food Trade Show & Industry Conference on March 25 can be seen by clicking here and here. 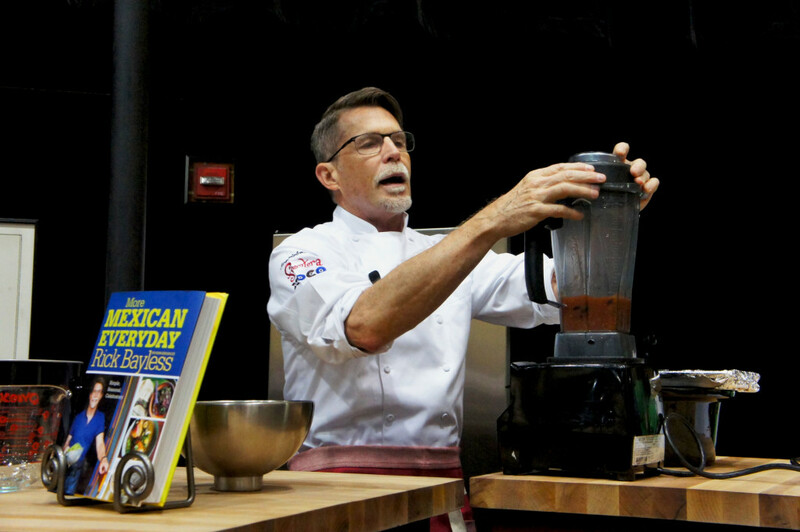 Rick Bayless’ regional Mexican cuisine at Frontera Grill, Topolobampo, Xoco and other locations has made him a culinary leader in Chicago, and he is known nationally for his PBS series, Mexico One Plate at a Time, and his numerous cookbooks. 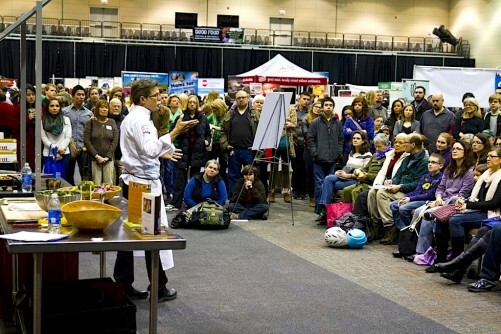 So it is never a surprise when he draws a standing room only crowd during one of his frequent visits to FamilyFarmed’s Good Food Festival. Bayless pureed tomatoes for a sauce that went into his Mexican pork and black beans recipe. His most recent cookbook, More Mexican Everyday, was on display. 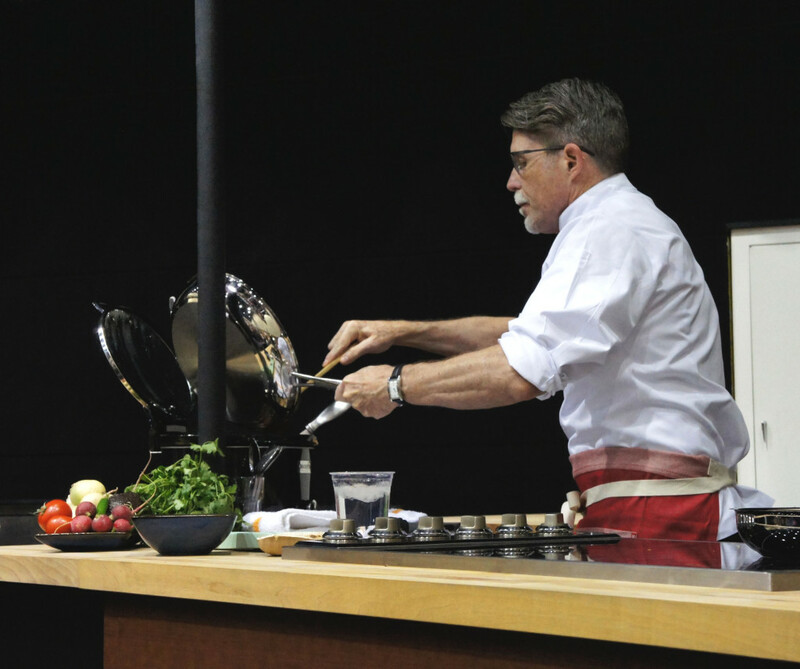 Bayless added his fresh tomato sauce to his slow-cooker pork and black beans preparation at his Good Food Festival demo. Leading figures in the Chicago region’s Good Food sector chatted before the Chefs at Play demos at the Good Food Festival kicked off. 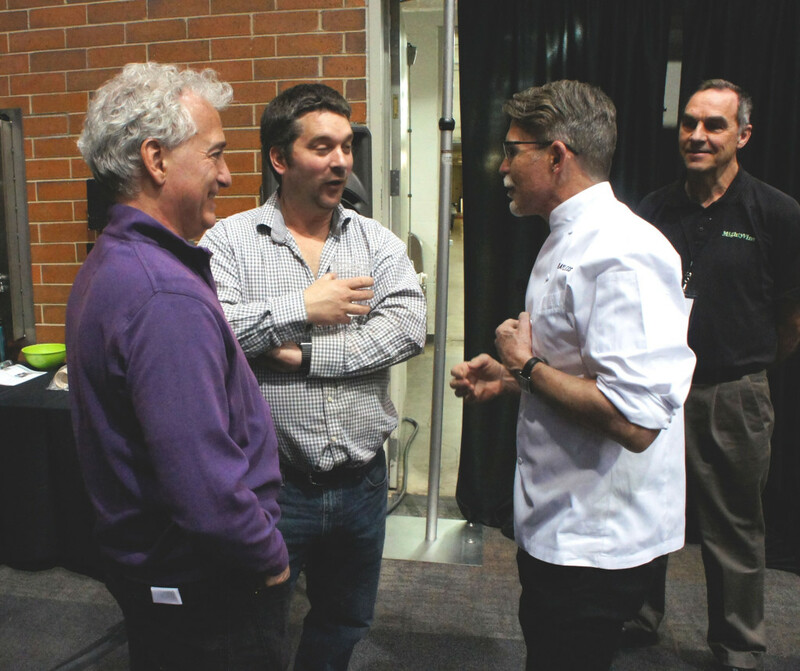 From right, celebrated chef Rick Bayless; Greg Gunthorp, a sustainable livestock producer in Indiana, who supplies much of the pork and poultry for Bayless’ restaurants; and FamilyFarmed President Jim Slama. Watching at right is Nic Helderman, chief operating officer for Mighty Vine, an indoor tomato producer that has made a big impact on the Chicago market for the quality of its products since it opened last year. 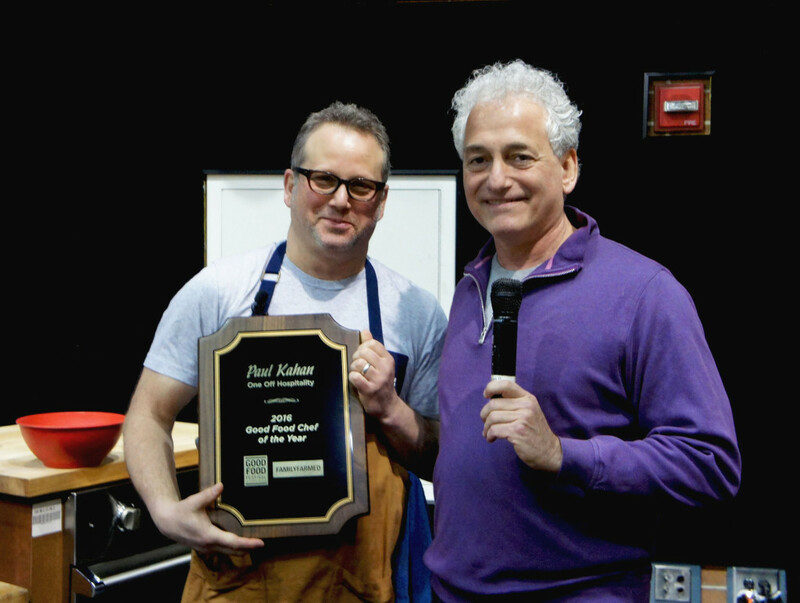 Paul Kahan (left) received FamilyFarmed’s Good Food Chef of the Year Award from organization President Jim Slama at the 2016 Good Food Festival. Kahan — who delivered a keynote speech at FamilyFarmed’s first Good Food trade show in 2004 — was honored for his dedication to local and sustainable sourcing at Chicago’s prominent One Off Hospitality Group restaurants. 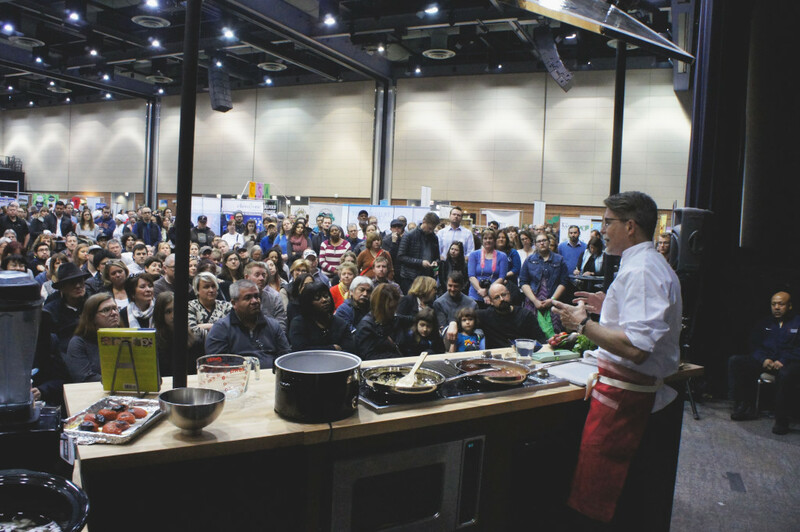 The Good Food Festival featured a chef demo aimed at spotlighting the Pilot Light program, in which chefs work with Chicago Public Schools to promote food education. 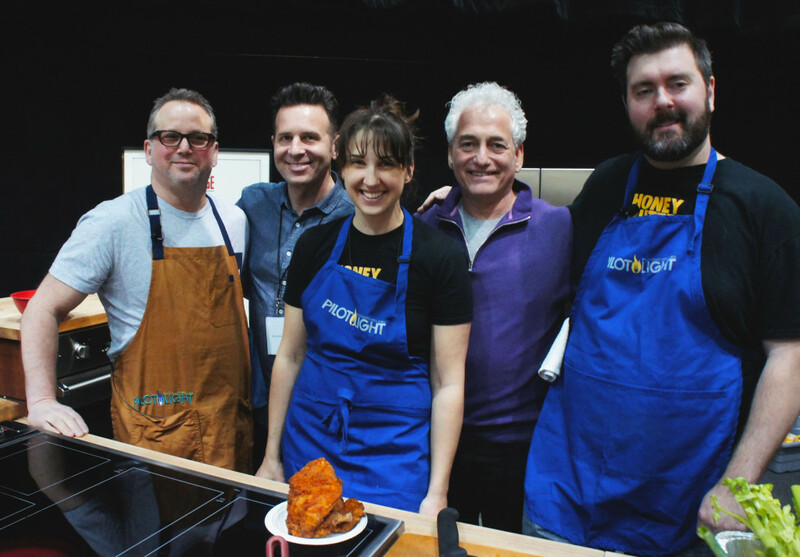 From left, Paul Kahan of Chicago’s One Off Hospitality restaurant group; food journalist Steve Dolinsky; and Honey Butter Fried Chicken’s Christine Cikowski and Josh Kulp flanking FamilyFarmed President Jim Slama. 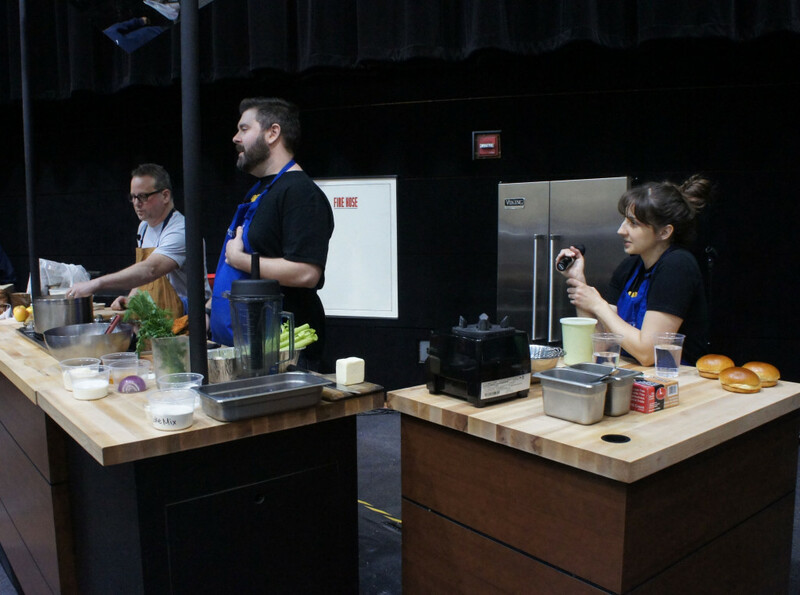 Josh Kulp (center) and Christine Cikowski of Honey Butter Fried Chicken joined Kahan (left) for a chef demo in support of the Pilot Light program in which they all participate. Pilot Light, co-founded by Kahan, works with Chicago Public Schools to integrate food education into students’ curriculum. 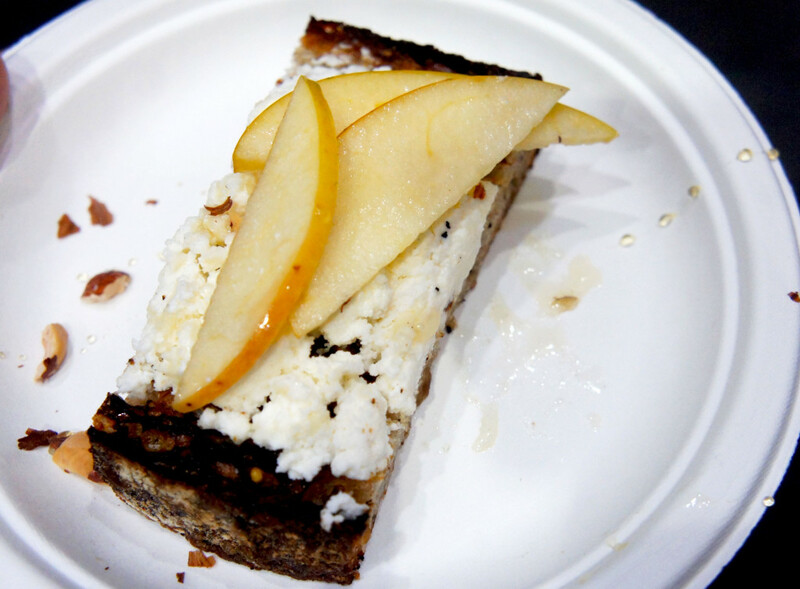 The word “fettunta” is the Tuscan word for “soaked slice” or, as Kahan describes it, “greasy garlic bread.” The version at the Good Food Festival demo — made with bread from One Off’s Publican Quality Bread, farmers cheese, honey and apples — was defined as delicious and easy to make. 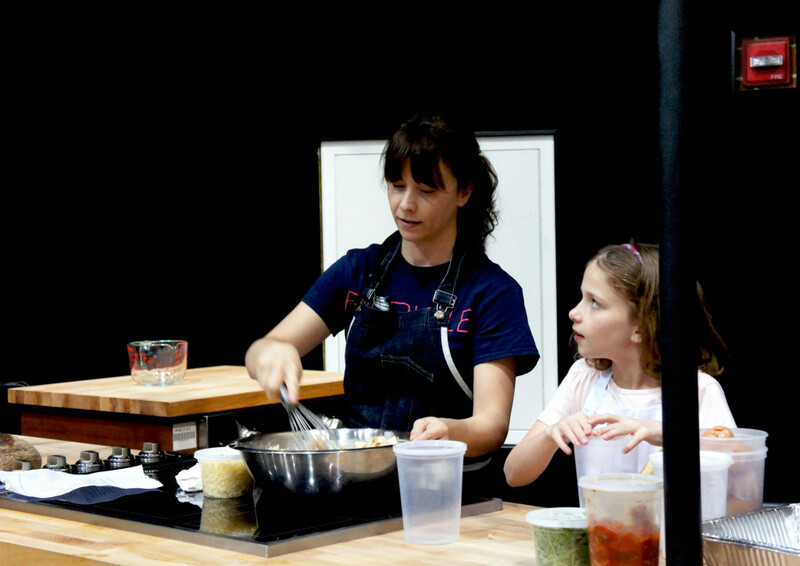 Sandra Holl of Chicago’s Floriole bakery and restaurant had some youthful assistance during her baking demo at the Good Food Festival. Holl received the Jean Banchet Award — Chicago’s top culinary honor — as best baker at a ceremony in January. 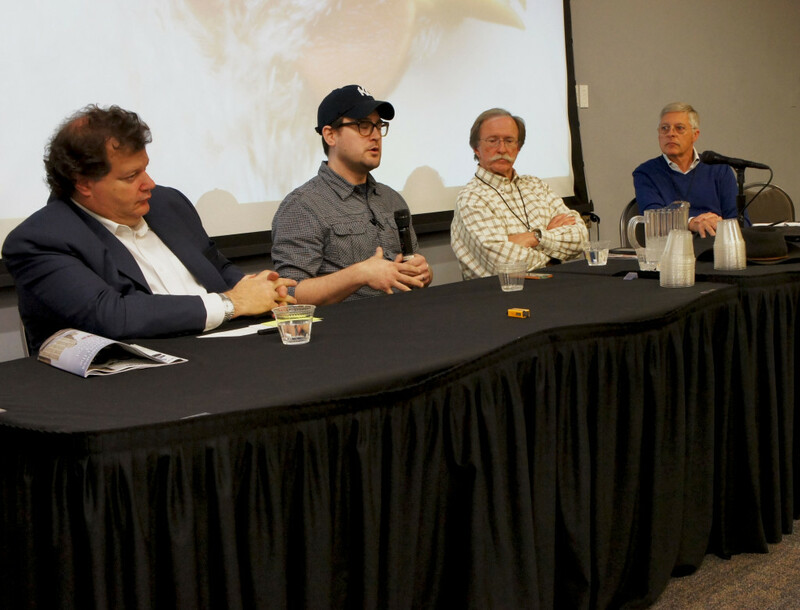 Participating in a panel on “The True Costs of Good Meat” at the Good Food Festival were Chicago restaurateur Michael Kornick; butcher-owner Rob Levitt of The Butcher & Larder at Local Foods Chicago; Tom Lutsey, retired chief farming officer of Waseda Farms in De Pere, Wisconsin; and restaurateur Dan Rosenthal, an advocate of using high quality, sustainably produced meat and co-founder of the Green Chicago Restaurant Coalition. 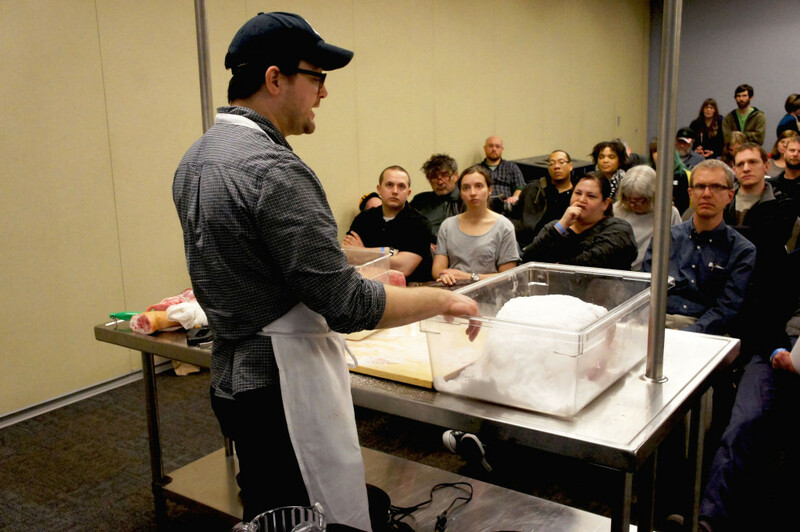 Rob Levitt of The Butcher & Larder then conducted a workshop about curing ham at home, a presentation tied to the fact that this year’s Good Food Festival occurred during Easter weekend. A master’s hands. 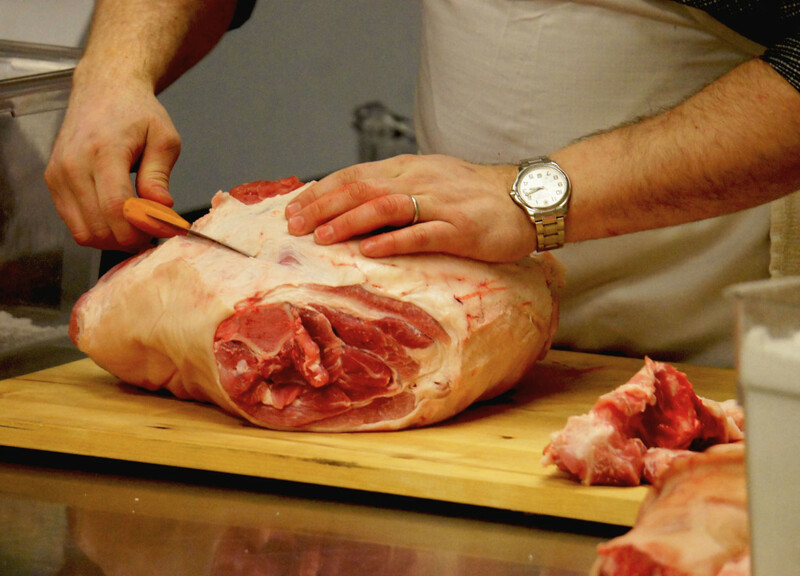 Leading Chicago butcher Rob Levitt prepared a ham for curing at his Good Food Festival workshop. 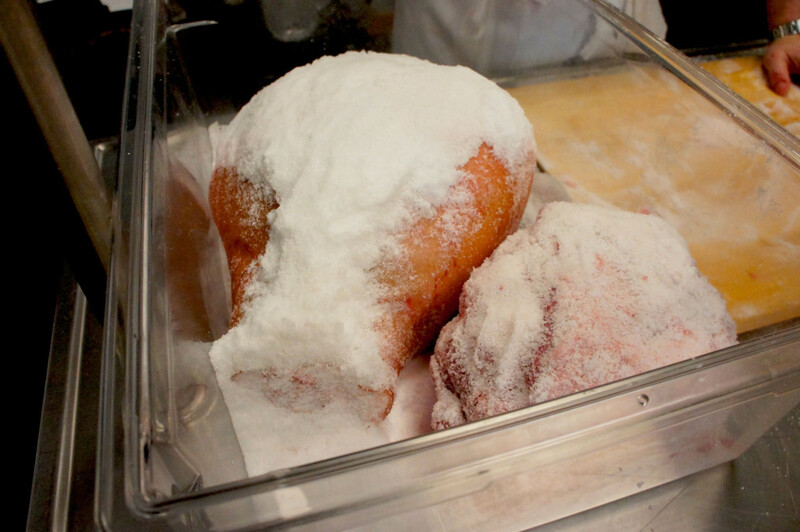 It takes a lot of salt to cure a ham. 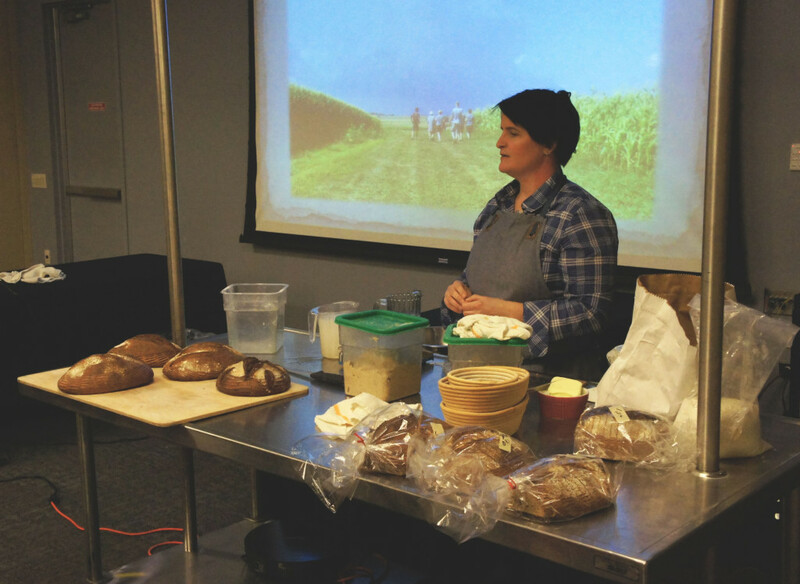 Ellen King, owner and head baker at Hewn bakery in suburban Evanston, held a workshop on baking bread with heirloom grains. She gets much of her grain from Hazzard Free Farm in Pecatonica, Illinois, whose owner, Andrea Hazzard, participated in the workshop. 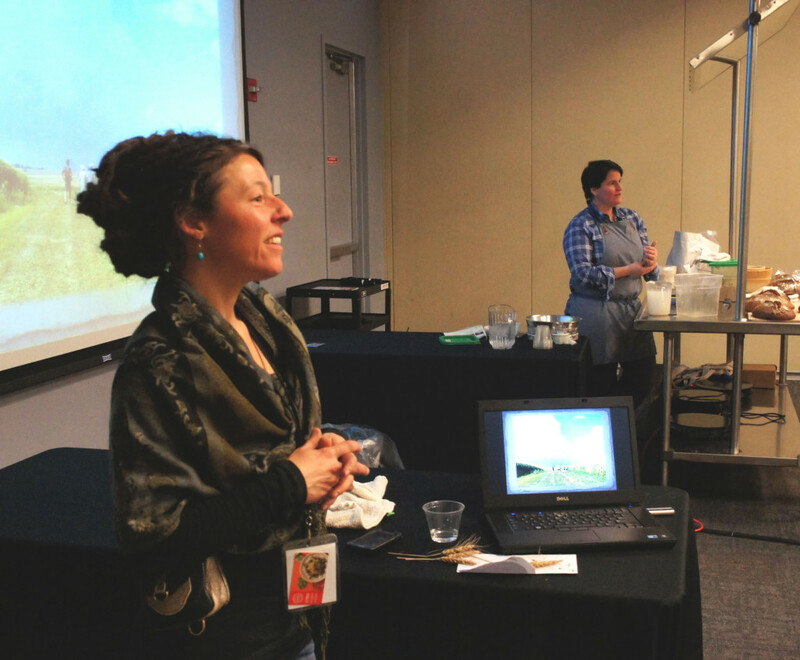 Andrea Hazzard (left) of Hazzard Free Farm and Ellen King of Hewn Bakery discuss their joint project, the Great Midwestern Bread Experiment, which aims to promote bread made with higher quality and more nutritious grains. 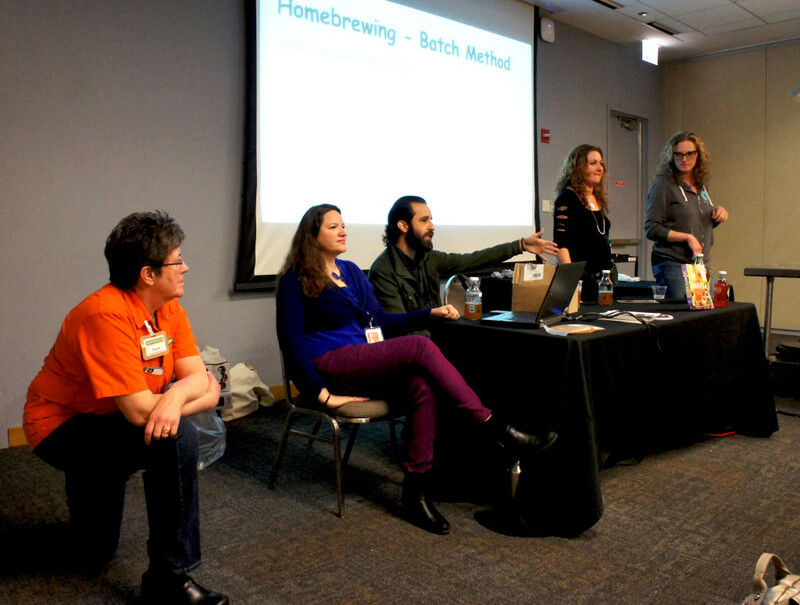 A Brew Your Own Kombucha workshop at the Good Food Festival featured Susan Fink of Karma Kombucha; Hannah Crum and Alex LaGory, married authors of The Big Book of Kombucha; and Alla Shapiro and Vanessa Tortolano of NessAlla Kombucha. 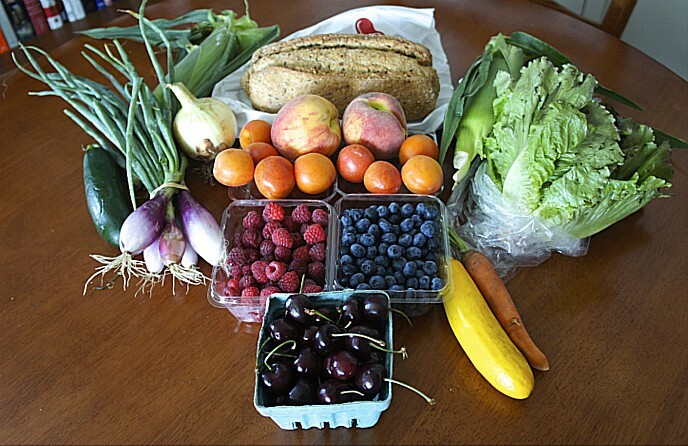 Fink is a Fellow in FamilyFarmed’s Good Food Business Accelerator, and her photo was featured on the front page of the Chicago Tribune’s Business section March 27 in a story about the Accelerator program. 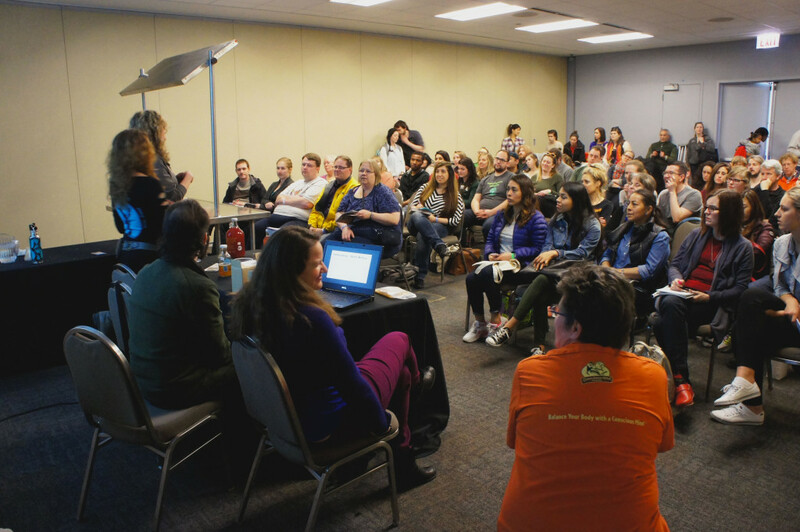 A sign of how the food world is changing: a standing room only crowd for a workshop on home-brewing kombucha. A Good Food Festival panel titled “Good Food is Good Medicine” featured physicians (from left) Adam Murphy of Lurie Cancer Center at Northwestern Memorial Hospital (who recently joined FamilyFarmed’s board of directors); Melinda Ring of the Osher Center for Integrative Medicine at Northwestern Medicine; and Geeta Maker-Clark, co-director of the Culinary Medicine Program at the University of Chicago’s Pritzker School of Medicine. The panel was moderated by Charlotte Flinn, FamilyFarmed’s board chairman (right). 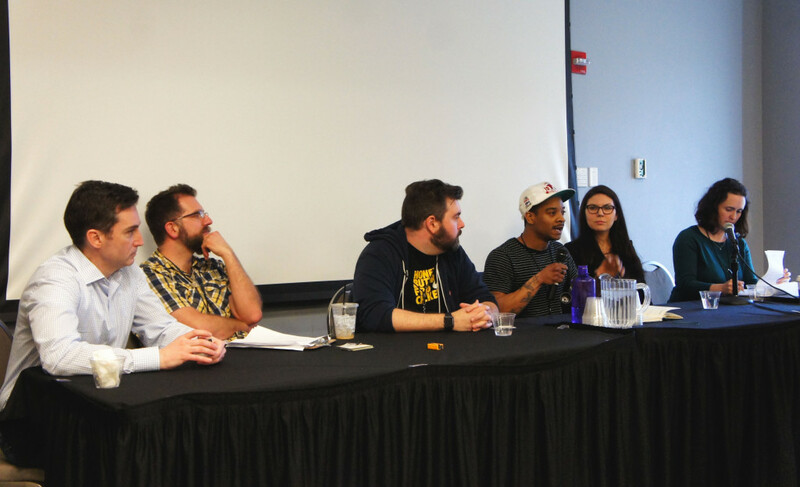 A Good Food Festival panel titled “Good Food and Farming Are Good Careers” featured (from left) John Wellehan, managing director of FamilyFarmed’s Good Food Business Accelerator; Eric Carlberg of Liberty Prairie Foundation; Josh Kulp of Honey Butter Fried Chicken; Darius Jones of Garfield Produce Company; Natalie Shmulik of The Hatchery food business incubator; and Jenny Doty of Angelic Organics Learning Center, who moderated. This entry was posted in Ancient grains, Butchering, Chef activism, Chef advocacy, Child nutrition and health, Cookbooks, Farm businesses, Food activism, Food and health, Food Artisans, Food Entrepreneurs, Good Food and economic development, Good Food Business Accelerator, Good Food business development, Good Food Festivals, Good Food Photos, Good Meat, Grass-fed beef, Healthy eating, Healthy eating for children, Heirloom foods, Local Food, Meat, Regional food systems, Restaurants and Good Food, Sustainable conferences, Sustainable dining, Sustainable food business investment and tagged Dan Rosenthal, Ellen King of Hewn Bakery, FamilyFarmed, Floriole, Food as medicine, Food entrepreneurship, Frontera restaurants, Good Food Business Accelerator, Good Food Festival, Good Food Festival & Conference, Green Chicago Restaurant Coalition, Gunthorp Farms, Hazzard Free Farm, Hewn Bakery Evanston, Honey Butter Fried Chicken, Jim Slama, Karma Kombucha, Michael Kornick, Mighty Vine tomatoes, NessAlla Kombucha, One Off Hospitality Group, Paul Kahan, Pilot Light Chefs program, Rick Bayless, Rob Levitt, Sandra Holl, The Big Book of Kombucha, The Butcher & Larder at Local Foods, The Hatchery business incubator, Waseda Farms. Bookmark the permalink.